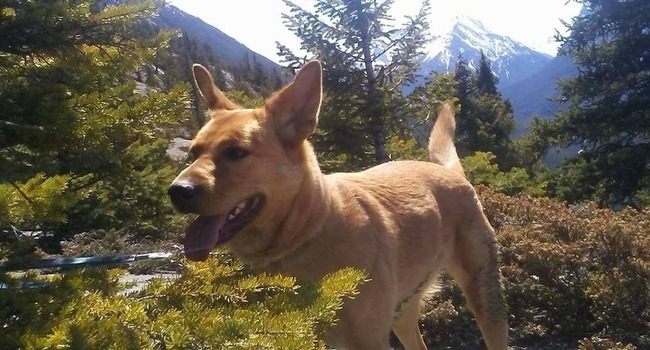 Momo is such a good dog, it wasn’t even HER OWN humans she saved on a hike in Canada’s Banff National Park this week. Kenzie Campbell took to the park’s Cascade Amphitheatre Trail with his girlfriend and another friend. Momo, their friend’s husky-lab-shepherd mix, was along for the walk. And thank goodness she was, because potential tragedy was right around the bend from the trailhead. “We walked around a corner and the bear was maybe 20 feet away,” Campbell told CNN. They backed slowly out of the woods, but the bear followed and charged. “At this point, the bear was 15 feet from my girlfriend and the dog was barking and growling, so I let the dog go and she distracted the bear while we ran,” he said. It was about a half-hour before they made it back to the parking lot, though they called 911 on the way and park staffers were waiting when they got there. Once safe in the truck, Campbell shot the above video of the bear, which had followed them and eventually wandered off. Bill Hunt, a resource conservation manager with Parks Canada, said the hikers probably startled the bear, which is why it charged. Seeing the dog likely didn’t help. Hunt recommends hikers travel in groups, carry bear spay, make lots of noise and keep their dogs on leashes. Or better yet, leave them at home. The female bear involved in the incident has extensive history with human encounters. She is known as Bear 148. “She literally has hundreds and hundreds of encounter with people every summer,” Hunt said. Momo was unharmed by the bear and returned to lots of very appreciated love and cuddles. Campbell has been dogsitting for Momo until the paperwork goes through for her to live with her owners, who just moved to the area. Samantha Emmons, Momo’s owner, was glad Momo helped protect her friends, though the prospect of the entire incident was frightening. Campbell says Momo doesn’t seem to think much of what happened, but she might be a little spoiled from all the extra treats and love. “She is a little queen right now,” he said.